Sarus is a bird loved and respected traditionally by people of Gujarat. Sarus is one of the resident species of crane in subcontinent. From the total Sarus population of 8000 in India, 1600 are found in Gujarat. Sarus is a monogamous bird - Pair for life. They live in pair and mate for life. Once a partner is selected, they remain together as long as they live. Sarus crane has a loud trumpeting call. Sarus is the tallest flying bird almost 5 feet. The present status of Sarus is vulnerable (IUCN Red data list). Its population is decreasing and this bird is on verge of extinction, unless some conservative measures are undertaken by all to save this people-loved bird. - Electrocution by high-tension power line. - Destruction of eggs by natural factors etc. Gujarat is one of few states in the country where world population of Indian Sarus Crane is concentrated. In Dholka, Daskoi and Dehgam areas around Ahemdabad, more than 300 Sarus birds are found. On representation by wild life photographer and coordinator of Sarus Nature Conservation Society, Mr. Deshal Pagi and Forest Department regarding causalities of Sarus due to electrocution, UGVCL's (Uttar Gujarat Vij Company Limited) top management visited site along with Forest Department officials and Mr. Pagi and decided to replace conventional wires by coated conductor to save the precious Sarus bird. In all, a total of about 10 Km conductor is replaced with coated conductor at the cost of approximately Rs. 3.0 Lacs in the year 2009. As a part of its corporate social responsibility and as a part of ethical business practices, public image and sustainable development, UGVCL succeeded in reducing the casualties to Sarus Crane bird by its noble gesture. When represented to the Company by Mr. Pagi, villagers and Forest Department officials, it was referred to the Corporate Office. The team of senior officials headed by the Managing Director Shri AK Verma (IFS) immediately decided to do all possible efforts for saving this endangered species and accorded sanctions to expend as a gesture of corporate social responsibility. Generally coated conductor is procured by the Company for replacing LT lines in village areas to reduce the theft by direct hooking. As here HT (High Tension 11 KV) lines were required to be replaced, special coating by XLPE for HT conductor was ordered and after follow up, special gangs were deployed to replace all possible open conductor by coated conductor in areas identified in joint site inspection. UGVCL is therefore pleased to say that due to positive approach and purposeful monitoring and sincere efforts of line staff and Sub-Division Engineers, the task was accomplished and causalities were reduced from 24 (during 2008) to 2 (during 2009). 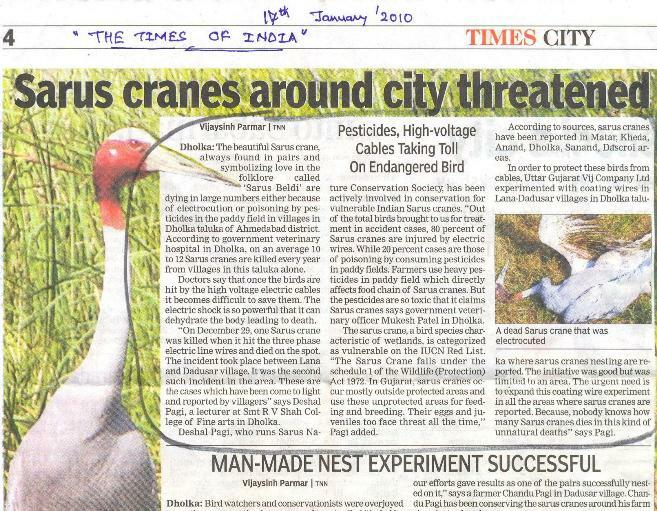 It is further requested to Forest officers and Mr. Deshal Pagi to inform any other breeding locations of Sarus birds if left out for similar endeavor to save this precious bird.
" LONG LIVE SARUS "